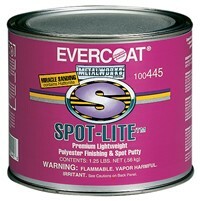 Evercoat Spot-Lite™ A paste putty that levels like a pourable putty. Contains Hattonite™ for improved sandability. Cures quickly to a sandable state which makes it the ideal product for quick spot filling. Stain resistant for use under basecoat/clearcoat repairs. May be applied to galvanized metal, aluminum, bare steel, body filler, two-part primers and sanded OEM finishes. Part of the MetalWorks® System. Blue cream hardener included.